What Is a Dollar Bill Made Of? The makeup of a dollar bill, like all United States currency, is a lot more complicated than it appears at face value. From unique paper stock reserved exclusively for printing money to intricate anti-counterfeiting measures, the humble dollar has come a long way since its introduction during the American Civil War. The contemporary Federal Reserve Note is printed on a blend of 75% cotton and 25% linen, making it incredibly durable when compared to paper made from wood pulp. The Bureau of Engraving and Printing claims it takes 4,000 double folds before a bill will tear, explaining why they tend to survive at least a couple accidental trips through the washer. The front and back of a dollar are printed using black and green inks consisting of dry color pigments blended with oils and extenders, making them especially thick. While the original reason for choosing the distinctive monochrome green back is lost to history, the decision to continue using the hue in modern designs was based on green pigment's ready availability, resilience and long standing association with the stable credit of the US Government. The $1 note originally featured Secretary of Treasury Salmon P. Chase's portrait until 1869, when George Washington's likeness replaced it. When the Treasury updated the design with the introduction of the Federal Reserve Note, Washington continued his reign as the face of the dollar bill, accompanied by the Great Seal of the United States on its reverse. Unlike other denominations, the $1 Federal Reserve Note's design has not changed since it was first issued in 1963. While the dollar bill doesn't make use of more recent anti-counterfeiting measures, such as watermarks and color-shifting inks, reproducing one is still quite difficult. All US currency paper contains small red and blue fibers woven throughout to hamper reproduction. The formulas for this unique paper are classified, as are the inks; even if you could acquire both, you would still have to recreate the meticulous intaglio printing process that gives the ink a distinct embossed texture. 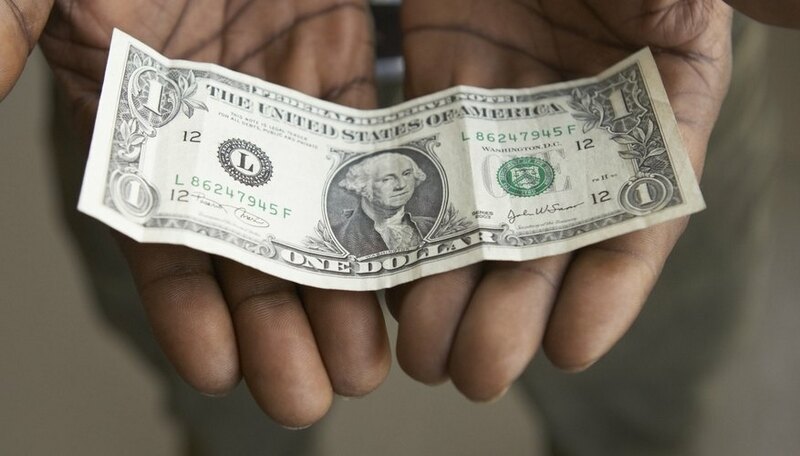 The dollar bill is the most prolific note in the United States accounting for 45% of all notes printed each year. The reverse sides of the original Demand and United States Notes were printed with a vivid monochromatic green, earning them the nickname "greenbacks." The average lifespan of a dollar is 5.9 years. Solids, where every number is the same. Ladders, where each digit is one higher or lower than the next in the series. Radars, where the number read the same from right-to-left as it does left-to-right. A writer and narrative designer in the games industry since 2008, Randy Begel has worked on such titles as Star Wars: The Old Republic and League of Legends. He holds a bachelor's degree in English from the University of Richmond.